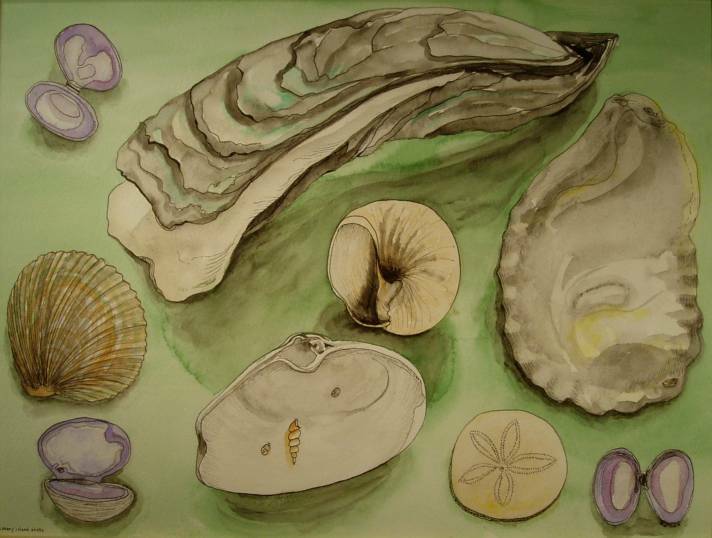 This is a drawing and watercolour painting that I did while visiting Savary Island, British Columbia. I collected shells for a couple of days, these are the biggest shells of each species that I found. I arranged them on the green kitchen table, and drew them life-size. They include a huge oyster shell, a couple of clams and mussels, half a geoduck shell, a moonsnail, and a sand dollar. It is drawn with a Pilot DR pigment ink pen and watercolour paint, on acid free heavy weight watercolour paper. The drawing is in an exhibition wood frame.